Following last week’s military coup – which is never the answer to anything – President Erdoğan is purging Turkey’s civic institutions of every whiff of opposition, dissent, criticism and minor gripe. It is unknown how many schoolteachers and university lecturers were driving tanks and flying F-16s threateningly over the Bosphorus, so 15,200 have been summarily suspended, and 1,577 university deans have been resigned. Teachers, of course, are among the most murderous of professions: their insidious progressive ideology corrupts the young, foments suspicion and threatens the conservative order. Far better to sack them all and appoint orthodox state educators, especially if you want to institute a new theo-political order of rights, peace and prosperity. Around 50,000 have been suspended or detained since the coup attempt. It is unknown how many of these will receive a fair trial given that they include 2,745 judges. It’s probably easier to accuse them all of sedition or membership of a terrorist organisation, and re-institute the death penalty. Fethullah Gulen had no idea he had so many loyal disciples, every one of whom must be rooted out and ‘dealt with’. But organising a dangerous coup in Turkey while you’re supping iced tea in Pennsylvania isn’t really cricket, is it? No wonder President Erdoğan has applied to the US State Department have him extradited – to be tried fairly, of course. If they can find a judge to preside. 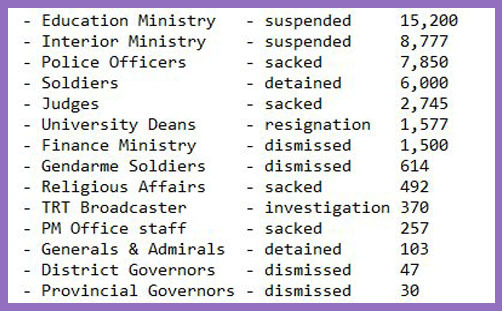 The speed and efficiency of all these arrests, sackings and suspensions rather suggests that Erdoğan already had a little list. If he didn’t, he must have found quite a few civil servants he could trust to identify very efficiently all the recalcitrant intelligence officials. And that pesky Religious Affairs Directorate has needed reform for at least 16 years. A failed military coup has to be followed by the broadest of purges, just as do successful ones. They are never the answer to anything. But it is curious how the Western world has expressed swift solidarity with President Erdoğan following the failed coup. They urge the People’s President to meditate on portraits of Mustafa Kemal Atatürk, and adhere to democratic values, human rights and the rule of law. Fethullah Gulen’s school of Islam syncretises conservative Islamic values with Western liberal-democratic culture. You may think they’re mutually exclusive: you need to read and study. Recep Tayyip Erdoğan’s school of Islam harks back to the Ottoman Empire (indeed, he is often called ‘Sultan’), and, while preaching the virtues of secularism, encourages Turks to ‘express’ their religious beliefs openly. He inclines toward a school of Sharia which would criminalise adultery and create alcohol-free zones, just like we have in Tower Hamlets. His objective is to “redesign the society according to their (AK party) beliefs and lifestyle”. But isn’t that the objective of every democratically-elected party? What is the threshold of tolerance in a democratically-elected leader who seeks to accumulate power by persecuting journalists, shutting down media outlets, stifling political opposition and stamping out dissent? Which is the lesser evil? The serious alarm of military coup – which is never the answer to anything – or a democratically-elected leader who seeks to create a ‘proper’ Islamic state, replete with its rather robust notions of unity and brotherhood? Which inclines most toward the beauty of the order of justice? Which reflects greater the image of God in Christ? Which inclines most toward tyranny? Which most denies the nature and condition of human desire, aspiration and hope? Which is more likely to nurture children in love, and render each man and woman their due? Which most truthfully mirrors the ordering action of God by caring for each and every one, irrespective of gender, race or religion? Is it better to live under an army general who eschews sectarianism, respects individual liberty and advances human rights, or under a president who is somewhat inclined to get his henchmen to bruise a few arms and compassionately bandage a few ears? The next time you fly out to Marmaris, think on these things.